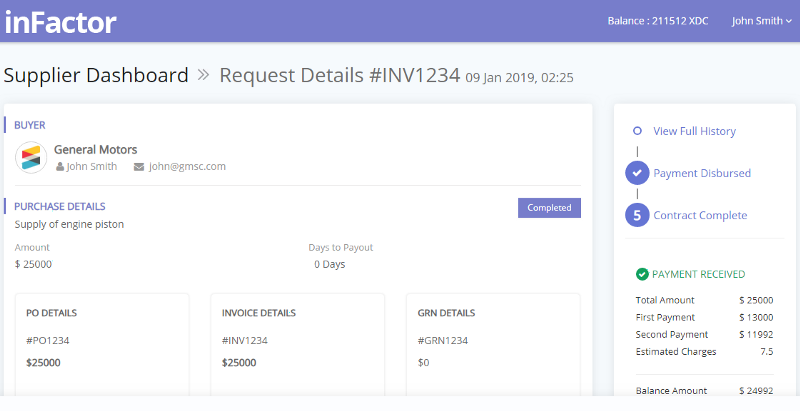 inFactor.io is an open standards framework for managing Invoices, orders between buyers and sellers and getting access to liquidity from global financiers through a peer to peer network. inFactor.io is built on ISO20022 based standards and can interact with data from any system in enterprise or banking and financial systems environment. The Hybrid network architecture of XinFin allows the enterprises and institutions to host sensitive data in a private network and only relay relevant information of it on the XinFin public network. XDC Protocol also allows buyers, sellers and financiers to quickly swap between any FIAT currency using XDC Protocol as a relay bridge thereby enabling instant liquidity and counterparty risk mitigation. InFactor.io can capture EDIFACT standard Invoice data —> transform it into ISO20022 standard. It then adds transaction hash value to the supplementary data field in ISO20022. The hash of the ISO20022 message is now created as a non-fungible smart contract in off-chain privacy layer that stays within the data hosting compliance. The off-chain smart contract is relayed as a on-chain hash with limited set of smart-contract variables to the XinFin Public Network. This instrument is now digitized and can be refactored across any global liquidity markets in regulated jurisdictions. Financiers can also mitigate counterparty risk by trading it in secondary markets. InFactor can also map any other Invoice standard used globally.